Marsh Harbour, the largest town in Abaco, continues to flourish into the island’s central hub for transportation, government and medical services. A new hospital, a government complex as well as an additional airport terminal all contribute to this expanding area. The new terminal at the international airport allows for an increase in daily direct flights from major U.S. cities and easier access to car rentals. Not to mention, the town plans to build a new sports complex for baseball, track and field, and soccer. Locals, yachties, and visitors enjoy running errands in the beautiful town of Marsh Harbour. You can find anything around town from furniture and hardware to groceries and neem oil products. Boaters from around the world venture to Marsh Harbour to dock at one of the marinas along the island’s “Gold Coast.” Bahamian cuisine and fusion-style restaurants offer a variety of options for the entire family. Enjoy the catch of the day, watch a sunset over the harbour or listen to live music with a drink in hand in this relaxing island town. Treasure Cay is a quaint town filled with beautiful beaches, shopping, and golfing. Spend the day golfing at the 5-star golf course or venture into town for some cinnamon rolls at the bakery. This active town is perfect for running, biking, and all the of water sports you can imagine. Embark on a chartered boat for some bonefishing or climb aboard a beautiful sailboat for a relaxing day out on the water. Or enjoy a cold drink and the beautiful sunset while eating dinner at one of Treasure Cay’s outstanding restaurants. When you’re not at home in Schooner Bay, there is no better place to relax than on the beaches of Green Turtle Cay. An island named after the population of green turtles that were once there in abundance. Meet some of the friendliest people in the world at the local bars and restaurants. The island depicts the loyalist heritage in the town of Newport, where the beaches invite you to unwind and enjoy the island breezes. The walkable town of Great Guana Cay has a lively social scene and breathtaking beaches. However, the area is most known for its amazing saltwater adventures. Rent a boat for easy access to the best spots or join a guided excursion. Snorkeling and diving are a must while visiting this island. After a day out on the water, find yourself enjoying a delicious dinner at one of the town’s local restaurants. Enjoy yourself while walking and biking through Hope Town, an old loyalist capital and the heart of Elbow Cay. Discover a candy-cane-striped lighthouse and waterside restaurants along with colonial Bahamian homes and shops lining bloom-filled streets. Filled with rich history, the volunteer-run museum tells the loyalist story including the tale of the town’s founder, Wyannie Malone, and her three sons. Man-of-War Cay is home to the boat-building centre of the Abacos. Here craftsmen build the famous Abaco dinghy by hand. The Albury Brothers, who have been boatbuilding in the Bahamas since 1952, are located here as well. Also, the Civil War wreckage of the Union’s USS Adirondack lies just off the cay, providing a great snorkeling and diving location. Albury’s Ferry is a family business known to customers for its impeccably run schedule and small acts of kindness. The company has been in operation since the airport opened on February 18, 1959. Today, the company’s fleet is made up of twelve “Donnies,” wide body fiberglass diesel-powered boats built to Albury’s Ferry specifications in Florida. 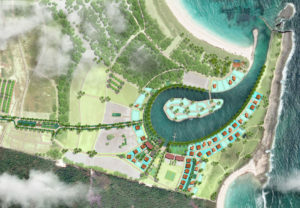 Schooner Bay offers an idyllic island lifestyle in a golf-cart- and pedestrian- friendly village setting. Here, you’ll immerse yourself in a natural wonderland of tranquil beaches, pristine forests, eco-adventures, infinite fishing and water sports.